NAPOLI REJECTED A bid of £95 million (€106m) from Manchester United for centre-back Kalidou Koulibaly, according to club chairman Aurelio De Laurentiis. 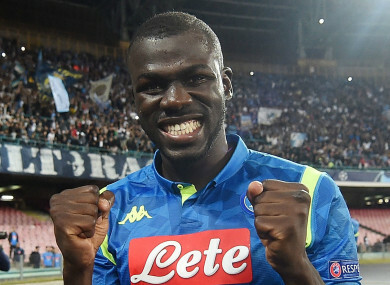 Koulibaly has emerged as one of Europe’s top defenders, having helped Napoli to back-to-back top-three finishes in Serie A. The 27-year-old’s exploits have captured the attention of several clubs around Europe, most notably Manchester United. Speaking to the media at an event held by Corriere del Mezzogiorno, De Laurentiis confirmed that his club had turned down a massive bid for the Senegal international. Mourinho was unable to sign the defender he craved at United, one of the many reasons United failed to live up to expectations during his reign. The Portuguese was sacked on Tuesday, two-and-a-half seasons after taking over at Old Trafford. One figure who did make the jump from Napoli to the Premier League is Maurizio Sarri, who left the Partenopei to take charge of Chelsea prior to this season. Sarri was replaced by Carlo Ancelotti, and De Laurentiis was quick to underline how much more involved Ancelotti is with the team’s sporting project than Sarri was. With Carlo you can sit and talk about football, he is a serene man with a thousand interests. Email “Napoli rejected €106 million Man United bid for star defender, claims chairman”. Feedback on “Napoli rejected €106 million Man United bid for star defender, claims chairman”.